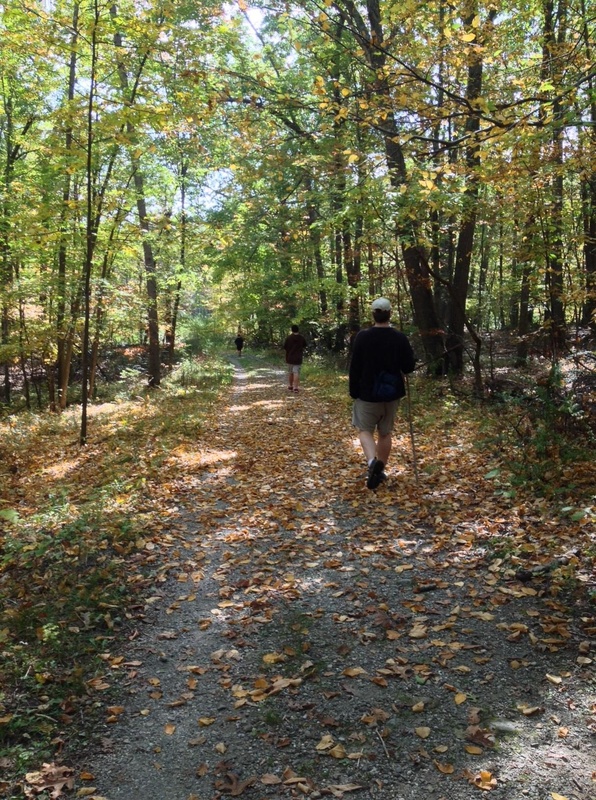 Recently I took them up to a section of the Appalachian Trail in Pawling, NY near Nuclear Lake. If nothing else I figured the name would intrigue them, and it did, for a while. That wore off quickly when they realized it was not adjacent to the parking lot and that there would be a long walk involved. This was during the government shut down last fall so we were greeted with a sign saying this section of the AT was closed. Oh well Dad, looks like we have to go home. Not so fast. How can they close a trail? Plus, we’re only going a few miles. The gunfire got louder as we got closer to the lake itself. Now I was wondering where it was coming from. I pictured a bunch of drunk rednecks shooting at beer cans with an AR-15 by the water’s edge. Did I mention that Nuclear Lake is so named because of an explosion at the facility that created the man-made lake in the 70s releasing radioactive material into the area. Am I Father of the year or what? Naturally the kids wanted to throw rocks in the water so they bushwhacked down there and began a barrage to rival the guns. Climbing through the underbrush to get back to the trail was almost the last straw. My daughter took a branch to the face and there were several stumbles as we tripped over buried rocks. But we soldiered on. At some point my older son thought I said we were turning around, so the further we went the more angry he got. Good times. He decided to forge ahead on his own and wound up taking the wrong trail…we found him though. We managed to circumnavigate the lake with only one minor injury and even got to see some trees gnawed by beavers. My city raised wife pointed out that she had only seen that in cartoons. Spirits raised a bit on the way back and we talked about the thru hikers that hiked over 2,000 miles from Georgia to Maine, the kids were suitably impressed. Unfortunately we didn’t run into any that late in the season. Back at the car we checked to see how far we’d gone, almost 5 miles. Everyone was proud that we made it that far, where was this enthusiasm two hours ago? We stopped for ice cream on the way home…in retrospect I probably should’ve mentioned the ice cream earlier. To find out more about this hike, please check Hike The Hudson Valley where you’ll find directions to the trail head and a detailed trail guide. Gallery | This entry was posted in Hiking, Kids and tagged day trips, hiking, kids, national parks, new york, parenting. Bookmark the permalink. I get your posts because I grew up in Mt. Kisco and lived there until the age of 12. I’m 72 now. My family moved to Katonah in 1954 and then to Pawling in 1957 so your tale is of some interest due to the obvious connections. We lived on the other side of Pawling mountain from Nuclear Lake and I visited the site a few times because we had a neighbor who worked for the company which was using the lake for research. Nuclear Lake was so-named because a company, United Nuclear Corporation, was developing a nuclear reactor for private use. I believe it may have been the only privately owned reactor in the US at the time. I was very much interested in physics and, later on, majored in the subject in college, eventually getting an MS in the subject. I don’t know where you got the story about an explosion in the 1970’s creating the lake, but it is quite untrue. Nuclear Lake was there and so-named in 1957 when I first came to Pawling and was not created by an explosion. There was a *chemical* explosion in the 1970’s which scattered some radioactive material (plutonium?) around but it was not anywhere near powerful enough to have created a lake. News descriptions at the time mention windows being blown out in a building and serious personal injuries to workers, but that was about all. The contamination from the explosion was cleaned up afterwards. There are some unsubstantiated reports of radioactive materials deposited in the lake which, if true, are probably due to lousy waste management by UNC, not the explosion. A little paranoia and a few unsubstantiated rumors can lead to stories like this. Best not to perpetuate the misunderstandings. I didn’t mean to imply that the explosion created the lake. I did understand however that the lake itself was made BY the facility and not a natural lake. Any references to dangerous radiation are tongue in cheek. I believe there was some question about routing the AT through the area and it was deemed clean enough. Check the Hike The Hudson Valley page as they link to articles about the explosion and someone who had a relative who worked there added some more detail to the story. It’s a beautiful area and I go there often.